Use it as a Liquid Propane Gas Grill --or-- use it as a Charcoal Grill --or-- use the Smoker Firebox for indirect cooking and authentic BBQ Smoke Flavor --or-- use the Infrared Searing Burner to sear your meats! Four (4) Grilling options in one unit!! Prepare your next BBQ just the way everyone likes it, this grill has it all! Ceramic infrared side burner that will sear steaks and seafood to seal in the flavor. 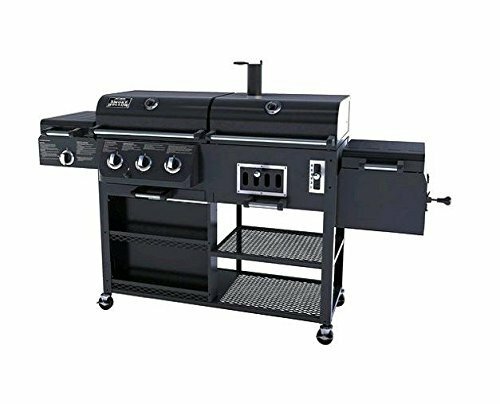 Enjoy the convenience of a three-burner LP (Liquid Propane) Gas Grill (tank not included) that can cook up to 20 hamburgers at a time. Also a Charcoal grill with an adjustable charcoal pan for easier temperature control while providing that charcoal-grilling flavor. And the offset, side smoker firebox that can be used with flavored wood chunks and charcoal for indirect cooking and authentic BBQ smoke flavor. This is the perfect grill to enjoy multiple styles of BBQ cooking, and is great for family meals or large gatherings of friends and neighbors.